Germany has never ceased to amaze me with its bands’ amazing skills on creating well made traditional Heavy / Power Metal. Though everything in Heavy Metal naturally came from England, the Germans, for years along with the Swedish in the north, took the reins of leading the worldwide traditional Metal scene into glory rides. SACRED GATE were introduced to me by their highly acclaimed guitarist, Nicko Nikolaidis, that in overall pretty much reminded me of another German band that I know and admire, MYSTIC PROPHECY, where once two Greek oriented members (One was Gus G. that left after several of years) that made a hellish beast to come alive. After three years of existence, Nicko Nikolaidis, and his fine crew (among them is MADE OF IRON’s singer, Jim Over), released their debut EP / Demo, “Creators Of The Downfall” on their own. The EP’s span of six tracks, three on the studio and rest live concert, tells the story of band that probably adores NWOBHM alongside IRON MAIDEN and JUDAS PRIEST. Call this a common thing for a traditional band, you are correct. However, I believe that it is all about the performance and the material at hand. In that area SACRED GATE did it more than just good. Though the material in general is pretty common for Heavy / Power Metal, especially the constant stuff that the 80s introduced, it was written and performed with taste. 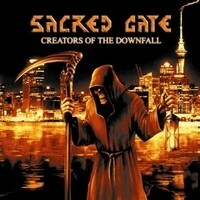 The first two tracks, “Creators of the Downfall” and “Burning Wings” showed quality in both sound and music. Nikolaidis is an amazing guitar player as he channels that roots of the past with his sharp edged playing, especially with those MAIDEN oriented harmonies and Murray like solos. On the front, I really fanned Over’s voice and singing rhythms. He is a true talent and certainly not new in the game. In general, those songs were flowing, enchanting with their melodic rhythms and beats. I have to admit that I less concentrated on the live showcase, though I didn’t ignore it either. I can’t wait to listen to “The Realm of Hell” and the valor tale of “Path to Glory” after a studio production. Those are interesting tracks that were performed with excellence. In contrast to the studio tracks, those sounded a bit heavier, yet anything can change as the hand of the studio will rise upon those babies. SACRED GATE shares their love for tradition and I respect them for it. Indeed they are common in their style like many other bands of the same, however, it takes a talent within the band to glorify even what is universal.